Light NE - shifting breeze, part cloudy. Nets open 06.30-15.30, netmeter hours approx. 2800. Playback on Green Sandpiper. Ringed: Green Sandpiper 2, White Wagtail 1, Barn Swallow 7, Northern Wheatear 1, Fieldfare 1, Common Whitethroat 2, Willow Warbler 18, Chiffchaff 1, Common Starling 3, House Sparrow 12, Chaffinch 5, Greenfinch 4, Common Linnet 1, Yellowhammer 1. Total = 59. Also 7 controls. 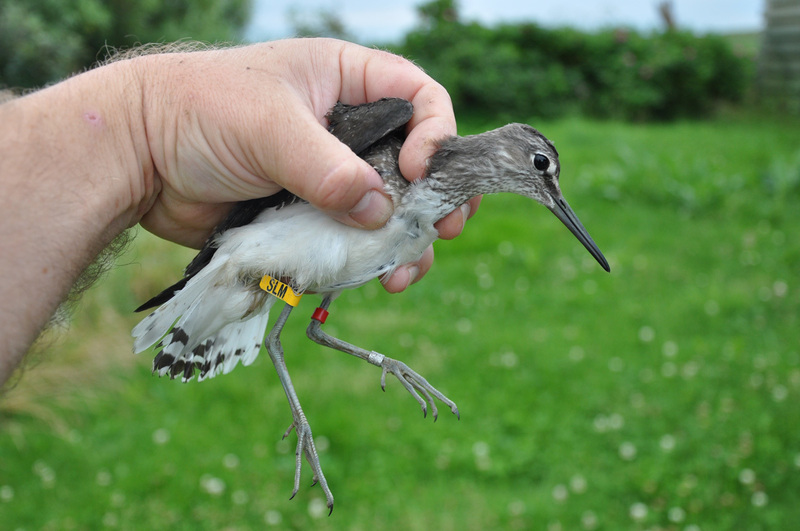 The first two juvenile Green Sandpipers of the summer was ringed today. Norwegian birds have a red marker on the left tibia and a yellow flag with 3-letter inscription on the right tibia. Skogsnipe 1K. Bird Observatory: Common Quail 1 singing. Revtangen: 3-400 waders, including 13 Little Stint, 90 Red Knot, 80 Dunlin, 35 Turnstone and 80 Sanderling.